This is an English locational surname. It originates from one or all the villages called Hazlewood found in the counties of Norfolk, Nottinghamshire, and particularly Yorkshire, where there are, or were in ancient times, townships in the parishes of Skipton and Tadcaster. The earliest recordings are from Yorkshire, and it is believed that these were associated with the manor and castle of Hazlewood, three miles west of Tadcaster. These first recordings dating from the original Poll Tax returns of the year 1379 include: Ricardus de Hesilwode and Robertus de Heselwode, which despite the slightly differing spellings were believed to be related and may have been father and son and as such lords of the manor of Hazlewood. Most surnames are 'from' names. That is to say surnames given to people as easy identification, after they left their original homes and moved elsewhere. This may not be the case with this name, and it is possible that all nameholders descend from the original land owners. 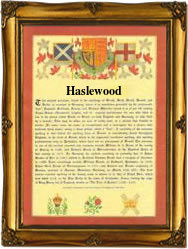 The name means 'the hazel wood' from the Olde English pre 7th century 'haesel-woda'. The name was an early recording in surviving London church registers. An example being John Hasylwood, who married Katheryne Weste, so much for medieval spelling, at the church St Michael's, Cornhill, in the year 1553.